Johan Badenhorst and his intrepid travel companions have just launched their latest Voetspore TV production, curently showing on Kyknet on Friday evening at 18h00. Johan and some of his team presented a teaser to invited customers recently at 2 of our dealerships and brought the Amarok's they used along for customers admire with envy. What a treat to listen to a man with such a feeling for Africa and the area they travelled through from Augulhas to Alexandria. A riviting presentation filled with facts, fun and spectacular photography, Johan had the audience spellbound until the end. So many interesting places to see and experience and he had most of us wishing we could jump into a 4x4 right there and then and tackle this stunning continent we live in. He delighted enthusiasts with his honest consideration of the Amarok as a true overland vehicle. The evening was completed with a lovely meal and the opportunity to share experiences and stories with like minded customers. The invited guests from Benoni Citi Volkswagen and Unitrans Volkswagen Commercial in Tulisa Park were priviledged to be able to hear from this delightful raconteur first hand. SA National Parks rangers shot dead a suspected rhino poacher and wounded two others at the Kruger National Park on Tuesday. SA National Parks rangers shot dead a suspected rhino poacher and wounded two others at the Kruger National Park on Tuesday, the Hawks said. Dr Fowlds sent us the following and has asked we share with all! This was written last night MONDAY 6 MAY 2012. As I write, a beautiful full moon, the brightest phase of 2012 illuminates both the good and evil in the African landscape outside. How often in this world do a small minority of evil men, a fraction of all those that stand for good, dispossess the rest of us of beautiful moments such as these. The man in the moon, designed to mesmerise us with a peaceful sense of innocence as that big round smiley face looks down on us from above. I have always associated his expression with a sense of quite contentedness as his full face turns to look in on what we are up to on a monthly basis before going slowly back to his other business and leaving us to wonder up at the heavens on those spectacular dark, clear, African nights. We have reached Gorak Shep after some difficulty with the altitude on reaching Lobuche. Dante was not feeling great and it was a consideration to retrace our steps. He did though have the opportunity to meet one of his all time heroes Apa Sherpa who has completed 20 Everest summits. What a thrill for Dante!!! Today we have reached Gorak shep at 5003 m and are within sight of Everest Base Camp and the incredible Khumbu ice fall. All being good, we will reach our final destination of Everest Base Camp tomorrow. Dante is now well acclimatized and doing well. He is getting a great deal of admiration on this trek. Every year, Wildlands Conservation Trust arranges and manages a series of mountain bike challenges to raise money for conservation. 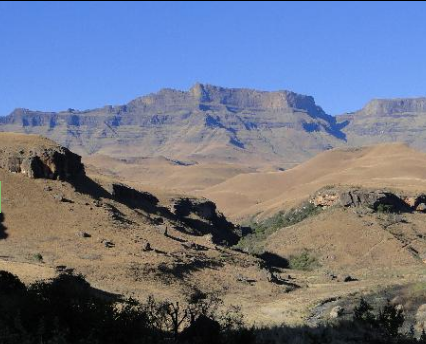 One of these events, the epic 75 km Giants Castle Bike Challenge takes place at Giants Castle in the Central Drakensberg Mountains. The Giants Castle Mountain Bike Challenge is one of the founding events of the Bonitas Wild Series which is celebrating its 15th edition of the challenge this year. The challenge takes riders up the Drakensberg mountain, through some of South Africa’s most pristine high altitude grasslands. Funds raised at “Giants” is used for the critically endangered Bearded Vulture. How can you help save our rhinos? If you had R2.738 million… How would you spend it?